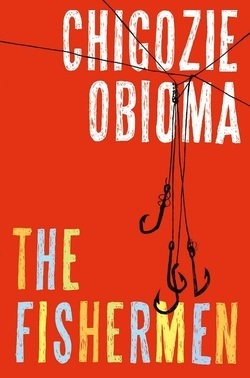 ashramblings: if I were fishing for a winner…..
A 1990s middle class Nigerian childhood in which the loving Agwu family is torn apart by the prophecy of the “madman” Abulu. Freedom for the four eldest boys comes when their father’s work at the bank means he has to live in Yola in the north far away from their southern home in Akure, returning only at the weekends, and they go fishing in the local river, the Omi-Ala, which has, unbeknown to them a bad reputation, having once been worshiped by local people. It is there that Abulu’s prophecy of fratricide is uttered. The character and story of Abulu is marvellous in itself – how he became the man he is today, what he did (raped his mother), how he looks and what he does (public masturbation) and says (prophesies) - as is the whole mix of African storytelling and Western novel. The first disintegration is of Ikena, the eldest son who is knocked of balance by the prophecy which shatters his love for his brothers. He begins to seriously fight with Boja, the next in age with whom he shares a room, and so the downward spiral of destruction starts despite his brothers pleas that they love him and would never harm him. The reader really buys into the conflict as retold by the now adult Benjamin recalling his childhood experiences and memories – his child’s voice is very authentic. Nigerian politics is a backdrop to a number of aspects of the story. The period is that of the military dictatorship of General Sani Abacha between the 3rd and 4th Republics, when the father wants his sons to be successful and has planned out various careers – doctors, lawyers etc - and to put behind them the corruption of the country through education and ambition. The change in status of the river echoes the change in perspective of the regime. The boys meet opposition candidate MKO Abiola and the fate of the gifted calendar is part of the story of destruction. Likewise the prophesy does not just impact the killer and the killed brother, but affects the others in the family. The mother, unable anyway to cope with the boys unruly behaviour whilst nursing their baby sister, has a nervous breakdown when Ikena is killed. The father has to give up his job and return home as he sees not only his career, his ability to provide for his family, but also his dreams for the boys’ future destroyed in turn. His resolve and love for his wife and children really come through in his determination to manage no matter what – he opens a bookshop to earn money, he hides his wife’s illness so no one will taint her, he tries to cover up his inadequate attempt to deal with Abulu so she will not know and never worry over this as well. I loved this story, the writing style, the characters, the the author has Benjamin describe each of the main people of the book in their animal form – tadpoles, falconer etc. As such it really does blend African and Western traditions seamlessly and smoothly. My radar is on high alert for his next book. This one has, quite rightly in my opinion been longlisted for the 2015 Booker, for the Guardian First Book Award and other prizes. ashramblings verdict 4* and I might even be persuaded to give it more! For me, so far, this is the best of the 2015 Booker Longlist I have read. and yipee it made the shortlist! !